Few could explain, let alone seek out, a career in criticism. Yet what A.O. 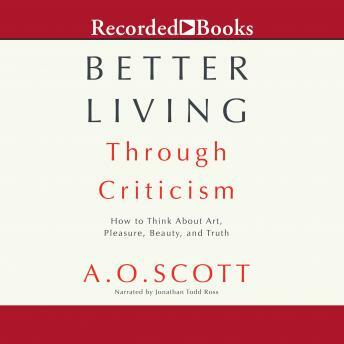 Scott shows in Better Living Through Criticism is that we are, in fact, all critics: because critical thinking informs almost every aspect of artistic creation, of civil action, of interpersonal life. With penetrating insight and warm humor, Scott shows that while individual critics--himself included--can make mistakes and find flaws where they shouldn't, criticism as a discipline is one of the noblest, most creative, and urgent activities of modern existence. Using his own film criticism as a starting point--everything from his infamous dismissal of the international blockbuster The Avengers to his intense affection for Pixar's animinated Ratatouille--Scott expands outward, easily guiding readers through the complexities of Rilke and Shelley, the origins of Chuck Berry and the Rolling Stones, the power of Marina Abramovich and 'Ode on a Grecian Urn.' Drawing on the long tradition of criticism from Aristotle to Susan Sontag, Scott shows that real criticism was and always will be the breath of fresh air that allows true creativity to thrive. "The time for criticism is always now," Scott explains, "because the imperative to think clearly, to insist on the necessary balance of reason and passion, never goes away."